Rotating, self-leveling cab turns 290 deg. 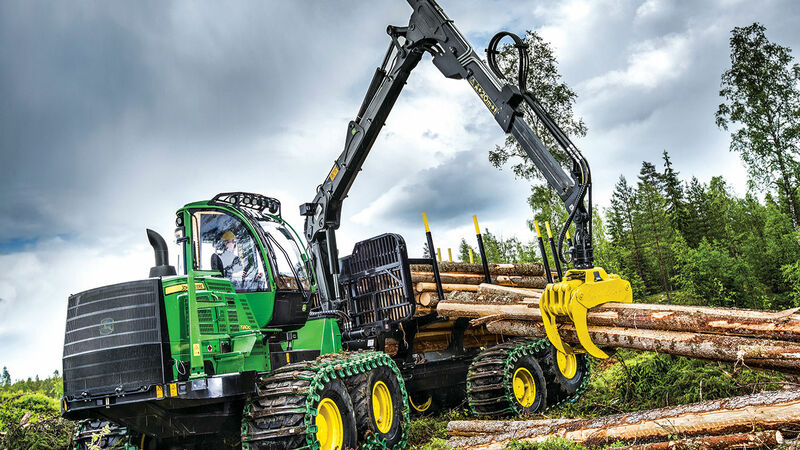 for an all-around view of boom movements and the jobsite, for safe, efficient log loading. Exclusive TimberLink automatic monitoring system keeps an eye on operating costs while tracking machine performance and efficiency. Work-cycle information, such as loading and driving times can be used to fine-tune settings and improve operator technique. TimberMatic F-12 control system delivers fine-tuned hydraulics, for effortlessly smooth forwarder functions. Optional Intelligent Boom Control eases boom operations, making them more precise and productive. Joysticks are configurable to user preference, so operators can run IBC using their preferred control patter.